Most people who go to the mage’s college don’t have a moment to spare from research, much less the time and mental energy required to regularly meal plan before shopping. While I am pretty good at planning meals, sometimes things go awry. There could be a delicious looking veggie on sale, or a grain I’ve been meaning to try, and suddenly I’m in unknown territory. I have to try to figure out something to fling together from what I have on hand without having to search for a whole new recipe! One of the tricks that has helped make adventuring into the unknown particularly rewarding is having a solid go-to sauce. Mine is 3-4 ingredients (hoisin is optional, and I only usually add it if I have broccoli or need to thicken the sauce) but it always produces a savory, tangy sauce that can make strange pairings and combinations feel familiar! This sauce works particularly well with the more absorbent grains like rice, quinoa, barley, or millet, though I’ve paired it with kamut and pasta- those didn’t look as nice, but were still tasty! To make an easy meal, I combine a grain, a protein, and a veggie or two and cover it all in the sauce! My most common go-to is brown rice or quinoa, topped with steamed broccoli and kale, and a can of chickpeas. An easy plug-and-play guide for two servings is 1 dry cup grain, 2 cups of chickpeas or equivalent protein, and 3-4 cups veggies, topped with sauce as desired! Give the recipe below a try, then maybe try adventuring- like with millet and roasted cauliflower, or barley with asparagus and carrots! Steam broccoli in a covered dish in the microwave or your heating method of choice until about halfway cooked (this takes about 2 minutes on high using a steamer I have, your time may vary! 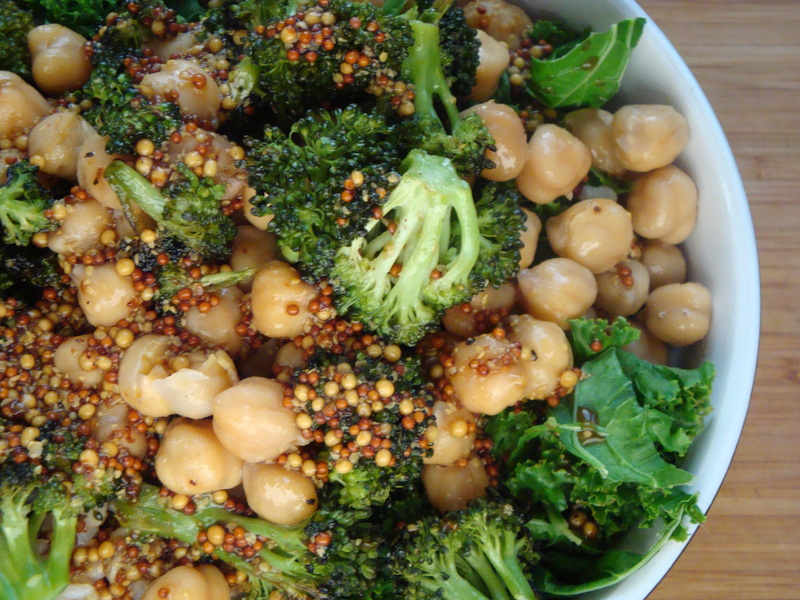 ), then add the kale and chickpeas, stir or toss to combine, sprinkle with salt, pepper, and garlic powder if desired. Microwave on high until broccoli is done and kale and chickpeas are heated through. Combine sauce ingredients in a small bowl, set aside. Divide rice between two bowls (or a bowl and a lunch container! ), top with veggie and chickpea mixture, and drizzle with sauce as desired and enjoy! This entry was posted in comfort food, quick dinner, simple and satisfying and tagged clean up, comfort food, dinner, easy, healthy, rice, simple, vegan, Veggies, versatile. Bookmark the permalink.